While you will find an auto parts store on just about every corner, don't be tempted to save a few dollars on parts when it's time for a repair. Always buy OEM (original equipment manufacturer) from your O'Brien dealership. OEM or Genuine parts are those installed on an automobile at the factory, which carry the manufacturer's warranty. They meet all factory specifications for fit, finish, safety and crash worthiness and are sold over the counter at all of our new car dealerships. Aftermarket or generic parts, on the other hand, are not produced by the vehicle's original manufacturer and are not subject to the same testing procedures. Hence, automotive technicians and collision specialists will tell you aftermarket parts are not of the same standard in quality to OEM parts and demonstrate decreased tolerances for corrosion resistance and lower crash resistance than factory-approved parts. Using aftermarket parts can lead to a variety of problems for your vehicle, and it can also make a simple repair much more difficult! 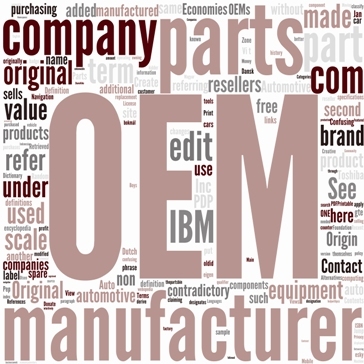 Here are three reasons to always utilize OEM parts for all maintenance and repair procedures. Quality. An OEM part is designed to work exactly the same as the piece it is replacing. This gives you the peace of mind knowing that your car should perform the same as it did before. Warranty. OEM parts usually come with a one-year warranty. Some OEM parts have a Lifetime Guarantee on such items as mufflers, shock absorbers, struts and strut cartridges/inserts. This means if you have any of these parts installed at one of our dealerships and the part fails, it will be replaced at no charge. Simplicity. By sticking with OEM parts, you don't have to weigh the quality of numerous brands and worry about choosing the right one. You know the OEM part will fit and work the way it is supposed to. When warranty coverage has expired, car owners who need replacement parts have the option of choosing a new car dealer or an independent shop. One reason consumers occasionally choose an independent shop is price. There is a common perception that all OEM parts and repairs are more expensive at a dealership than at an auto parts store or independent shop. That's not true. Customers are often surprised to learn that the majority of OEM parts available at our Ford, Genesis, Hyundai, Mazda, Mitsubishi, Scion, Subaru and Toyota dealerships are competitively priced, compared to non-OEM parts available elsewhere. Plus, independent shops often call our service managers for specialized knowledge in diagnosing and installing replacement parts. When using OEM parts you can be assured every part must pass strict manufacturer and industry testing to be certified for use on new vehicles. Aftermarket parts are not held to the same standards and may be constructed of lower quality materials that will likely not last as long as their original counterparts. By using only original parts you can be sure the part will fit correctly and provide your vehicle with what it needs to run right for a long, long time. Another important reason to use factory parts is because you know they will fit properly. Many aftermarket manufacturers develop parts designed to fit multiple models of vehicles to allow broader mass production. This often leads to ill-fitting parts that require some sort of manipulation to get them to bolt on. Don't struggle with poor aftermarket parts and accessories, stick with what you know works, true OEM parts. By utilizing OEM parts from your O'Brien new car dealership in Georgia, Florida, Illinois and Kentucky you will maintain your car and warranty to the highest standard. In fact, there is a strong chance one of the stipulations of receiving the benefits of that warranty is that only OEM parts are used for all maintenance and repair services. This is because aftermarket parts may cause more harm than good in the long run. For replacement items that fall under warranty protection, new car dealers are required by the manufacturer to use OEM parts. Installing non-OEM parts could jeopardize a vehicle's warranty in some cases. If you drive a leased vehicle, check your lease agreement before agreeing to any mechanical or collision repairs. Some lease agreements stipulate that lessees must use only genuine OEM parts; doing otherwise could result in financial penalties at the end of the lease agreement. All vehicles require routine maintenance to remain safe and dependable on the road. During these maintenance services, including oil changes, fluid flushes, belt and hose inspections, etc., parts often need to be replaced. To ensure optimal performance and efficiency from your vehicle always use OEM parts. Remember, OEM stands for original equipment manufacturer and that means our trained mechanics always replace worn or broken parts with an exact replica of the part the vehicle had when it rolled off the assembly line. For professional auto repair at surprisingly competitive prices with quality manufacturer parts in Newnan, GA, Fort Myers, FL, Normal, IL, and Shelbyville, KY head to one of our eight O'Brien new car dealerships. We always use high quality replacement parts to ensure the safety and reliability of your vehicle. Knowing that sooner or later there will be a need for replacement parts, specifications for each part of every car are created when a new model is designed and built. These specifications are sent to manufacturers who use the blue prints to create a supply of Genuine OEM (Original Equipment Manufacturer) parts. When your vehicle is repaired at our dealerships, the OEM parts are exactly the same as those used to build your vehicle. OEM parts are literally as good as new. Nothing beats an original. Motorcraft® and Ford Parts are designed for Ford and Lincoln vehicles. Manufactured to strict specifications, they have undergone extensive laboratory and on-the-road testing. They're built to maximize the performance of Ford and Lincoln vehicles and provide the confidence the repair will be done right the first time. To ensure that your driving experience is consistently a safe and enjoyable one, your Hyundai relies on a multitude of remarkably sophisticated parts, systems and advanced technologies—all designed to work together. From its bumpers, structural and body parts to its suspension, electrical and powertrain components, each and every part has an important role to play. When a repair center is allowed to use anything less than Hyundai Genuine Parts, you run the risk of having your vehicle’s appearance, performance, reliability—and even its safety—compromised. Not to mention voiding one or more warranties. Imitation is not always the best form of flattery, or the best for your Mazda. For unsurpassed quality, fit, finish, appearance, corrosion resistance, safety and warranty coverage, remember to specify Genuine Mazda Parts whenever the need arises. Mitsubishi Genuine Parts and Accessories are engineered and manufactured to ensure a perfect fit and optimal performance for your vehicle. Along with using Mitsubishi Genuine Service, it's the best way to protect your investment for the long run. Is a Subaru still a Subaru if a part is replaced with anything other than a Genuine Subaru Part? We don’t think so. Our factory parts help maintain your vehicle the way it was designed – to take you wherever “out there” is… safely. Show genuine love for your Toyota by taking care of it with Genuine Toyota Parts. They're built to the highest standards of quality, durability and performance, and they're designed to fit your vehicle's exact specifications.